They aren’t spaghetti neither fusilli. Of course, they are handmade according to the best Italian culinary tradition. What are we talking about? Of pici: fresh handmade pasta, typically from Tuscany (very common at Siena), but also from some parts of Lazio and Umbria. The name pici recalls the word ‘appiccicare’ that means ‘to join, glue, attach’. Actually, to prepare them you have to use your hands, with flour and water, with no eggs. 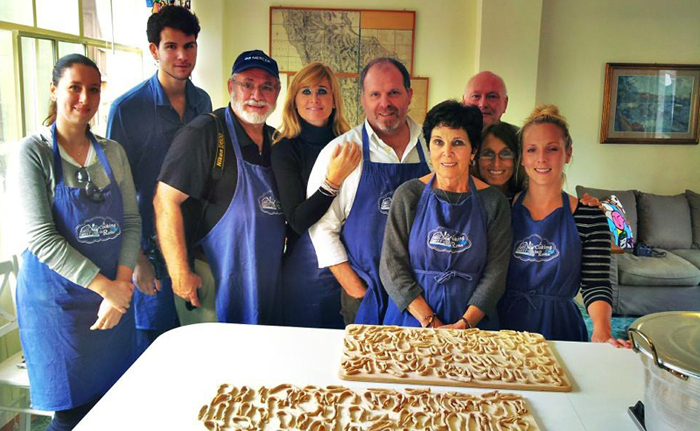 Experience Italy joined a cooking class in Rome for you, to learn how to prepare them, according to Grandma’s recipe. 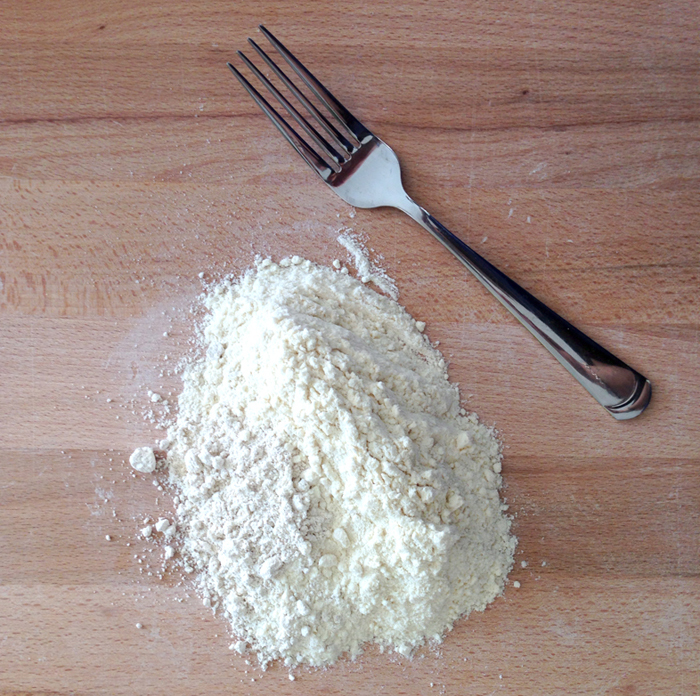 On a wood board, we started with 25 oz of ‘type 0’ flour and 6.25 oz of chestnut flour. Adding a normal glass of water, you have to work the flour, to obtain a consistent, compact and just a little damp mixture, that needs to rest for almost 10 minutes. 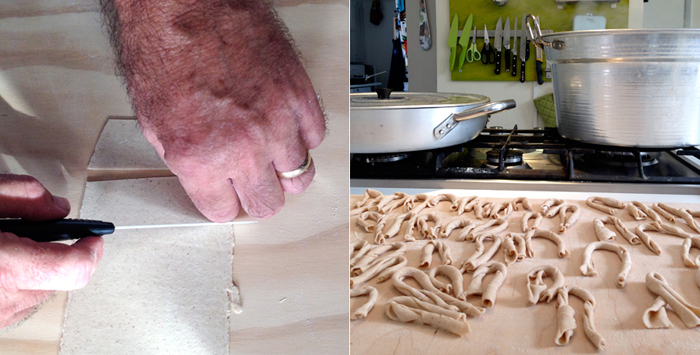 Later, with a rolling pin we stretched the pasta until a thickness of one third of an inch. Using a pasta maker, we then made a thinner layer. Yes, because smoother is the pasta, better is the result! Then, after cutting some stripes of pasta, we rolled them by hand, leaving them still on top of the wood board with flour. Meanwhile, we started preparing our sauce with sausage, fresh porcini and pomegranate, but feel free to eat pici with a tomato sauce, rich in garlic and bacon! In hot boiling salted water, our pici cooked in 5-6 minutes: as soon as they came to the top of the water, we pulled them out and added to our sauce… Of course, the right ‘partner’ of this dish is a tasty red wine. Once, in the countryside in Italy, pici were the only meal that farmers could afford, dressed with oil and onions. 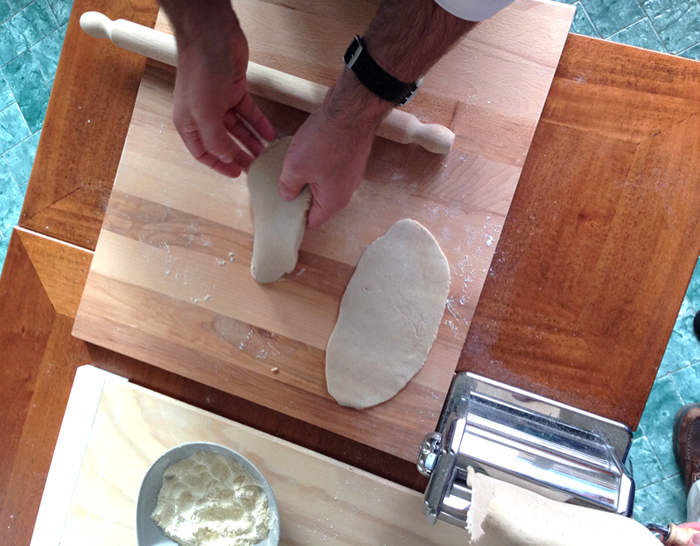 Today, spending some time to handmade our pasta is probably a gift to ourselves. Which better idea for next Sunday meal?